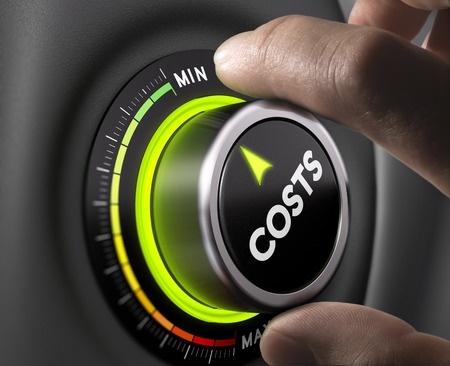 On Friday, September 29, 2017, after months of dysfunctional delay, the U.S. Senate finally got around to passing its own version of a budget blueprint for the U.S. government’s 2018 fiscal year, which officially got underway on Sunday, October 1, 2017. Politico ‘s Sarah Ferris describes some of the politics that are built into the Senate’s blueprint. The 89-page plan, which the Senate Budget Committee spent months drafting, sets up the special power of budget reconciliation GOP leaders can use to advance tax reform with just a 50-vote threshold in the Senate…. Under the budget proposal, Republican tax writers can add up to $1.5 trillion to the deficit over 10 years, giving lawmakers more flexibility as they attempt a once-in-a-generation revamp of the U.S. tax code. With more wiggle room to slash revenue, GOP legislators hope they will be able to go even lower on tax rates for individuals and corporations. The $1.5 trillion figure comes out of a compromise struck this month between deficit hawk Sen. Bob Corker (R-Tenn.) and tax-writer Sen. Pat Toomey (R-Pa.), who both sit on the budget panel. Corker had sought a revenue-neutral tax plan, while Toomey had called for as much as $3 trillion in lost revenue over 10 years. By comparison, the U.S. House of Representatives has proven much more capable of putting a budget for the U.S. government together, where it grouped 12 separate detailed appropriations bills into one large budget bill and approved it in one fell swoop two weeks earlier. In reporting on the House’s budget bill’s impact on funding for science and research programs, David Malakoff of Science looked forward to what will come next now that the Senate is taking its first steps. The House bills will ultimately have to be reconciled with versions passed by the Senate, which has yet to finish work on any of its 12 spending bills. To give themselves more time, lawmakers have already voted to extend 2017 spending levels for 10 weeks into the new fiscal year. That extension, known as a continuing resolution, expires on 8 December, and it is not clear whether lawmakers and the White House will be able to reach a 2018 spending agreement by then. If they can’t, Congress will have to pass another continuing resolution to avert a government-wide shut down. At least the politicians lived up to their commitment to not have another episode of federal government shutdown theater during Fiscal Year 2017, which just ended on Saturday, September 30, 2017! Still, with both the House and the Senate having committed to sharply increase defense spending over the levels mandated by the Budget Control Act of 2011, and tax cuts now being actively debated on Capitol Hill, the question of what kind of impact that both factors might have on the national debt are being asked. The Committee for a Responsible Federal Budget has analyzed both the House and Senate’s budget blueprints and projects a falling trend for the national debt when compared to continuing on the path set during the Obama administration. The following chart showing the percentage share of the publicly-held portion of the U.S. government’s total public debt outstanding from 2011 through 2017 and their projections from 2017 through 2027, illustrates their expectations. Here is how they describe how both House and Senate bills achieve that improvement over the next 10 years. Both budget resolutions would improve the debt outlook, but to different degrees. 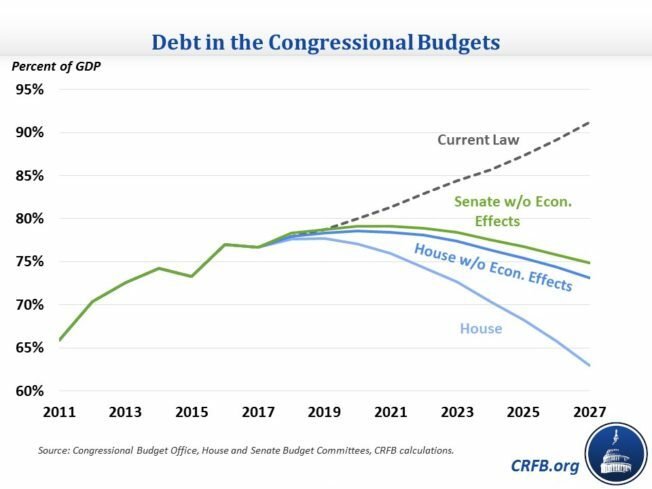 The House budget assumes savings and increases in economic growth that would reduce debt from its current level of 77 percent of GDP to 63 percent by 2027; ignoring economic effects, debt would fall more gradually to 73 percent in 2027*. Meanwhile, the Senate budget would result in debt increasing to a peak of 79 percent of GDP by 2020 before declining to 75 percent by 2027. This estimate ignores the budget’s claimed economic growth effects; it is difficult to determine what debt would be when counting economic effects based on the information given. Even though a new episode of government shutdown theater is now potentially on the calendar, the change in the direction of growth for both annual budget deficits and the national debt represents a positive development.